This topic explains how to monitor example services using the API Gateway Manager monitoring tools. 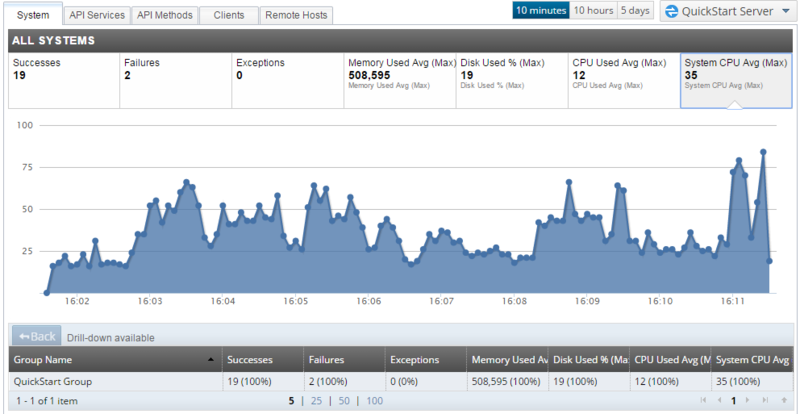 For example, these include real-time monitoring metrics, message traffic monitoring, and performance statistics. Note API Gateway Manager is designed as an operational diagnostics tool. API Gateway Analytics is recommended for monitoring and reporting of large volumes of historical data. For more details, see Monitoring and reporting with API Gateway Analytics. In the Policy Studio tree, select the Server Settings node, and select Monitoring > Traffic Monitor. In the Traffic Monitor settings, ensure Enable Traffic Monitor is selected. Select Monitoring > Real Time Monitoring, and ensure Enable Real Time Monitoring is selected. Click the Deploy icon in the Policy Studio toolbar to deploy these settings to the API Gateway. Alternatively, press F6. Note Enabling traffic monitoring may have a negative impact on performance. If you wish to maximize performance, you can disable these settings. For more details, see Traffic monitoring settings. Each time you send test messages through the API Gateway to an example service (for example, using API Tester or the Send Request (SR) tool), the message status is displayed in the TRAFFIC section. For example, you can click the Traffic button in the API Gateway Manager to view summary information for each message sent to the API Gateway. Alternatively, you can click one of the summary charts displayed on the Dashboard (for example, Messages passed or Messages failed). This displays the message traffic automatically filtered according to your selection. In the SELECTION pane on the left of the Traffic tab, you can click the Apply button to filter the messages displayed based on a range of criteria. For example, the default filters include REQUEST FROM (Client or API Gateway), MAX RESULTS PER SERVER, TRANSACTION STATUS, and TIME INTERVAL. You can click Add Filter to search on different criteria (for example, Service Name, Remote Host, Authentication Subject, Transaction ID, and Operation). The API Gateway inserts a transaction ID in all HTTP and HTTPS traffic in a header named X-CorrelationID. When you have selected your search criteria, click the Apply button. You can click Save Request or Save Response to download the message contents and save them to a file. You can click the Apply in the left pane to filter the performance statistics displayed based on different criteria. By default, the statistics are grouped by path name, with a time interval of 1 day. You can select different criteria from the GROUP BY and TIME INTERVAL lists. When you have selected your search criteria, click the Apply button. Note When a blocked message has failed in API Gateway, this means that a filter executed in a policy has returned a failure status. When a blocked message generates an exception, this means that a filter executed in a policy has aborted (thrown an exception). For more details on filters and policies, see the API Gateway Policy Developer Guide. System: Metrics for memory, disk space, and CPU. API Services: Metrics for messages and processing times. API Methods: Metrics for messages and processing times. Remote Hosts: Metrics for transactions, bytes sent and received, and response times. You can drill down to view metrics for specific components at the bottom (for example, for a specific API Gateway group or instance, service, client, method, or remote host). You can also configure the metrics time window on the right (for example, 10 minutes, 10 hours, or 5 days). You can click the Settings > Dynamic tab to configure trace, logging, and monitoring settings on-the-fly. These are dynamic settings, which means that you do not need to refresh or deploy to the API Gateway. For example, you can specify these settings for an API Gateway system, instance, service, interface, or path. For more details, see Configure API Gateway logging and events. This topic shows how to monitor API services using the monitoring tools provided with the API Gateway. API Gateway Analytics is a separately installed component that enables you to monitor services and to generate reports on the stored message traffic history in your domain. For more details, see Monitoring and reporting with API Gateway Analytics.